The newest penlight in the Roughneck family, the Rayovac LED Aluminum Penlight has the power to light up your everyday tasks! Compact, lightweight, and easy to carry, this penlight is comfortable to use with textured knurling and will easliy go with you everywhere with convenient clip. With its rugged aluminum build, and 1 meter drop tested durability, this light is perfect for a variety of tasks whether at work or around the house. Powered from 2 AAA high energy batteries, you can get an amazing 110 lumens out of its CREE LED for up to two hours in the high mode. Simple operation with one touch tail switch. Never be without a light on the job again! These new model Rayovac 2-AAA Flashlights are superb! Very well made. Simple design. Nice flat black color. Uses common AAA cells. It has a clip. Two light settings via the tail cap switch! High for two hours. Low for six hours. I'll use Eneloop rechargeables for unlimited run time. Nestles in your pants pocket ready for instant use! All good. No bad. Five Stars! I wanted and needed a new penlight with an on /off switch for my purse. Its bright and much easier to use than my old AAA flashlight that you turn the Lens to turn on. Dual brightness levels, Rayovac quality(best in the industry for its price range), and the price. You can't go wrong. This light is Fantastic for the price! The Dual brightness modes are handy! Well built light too! 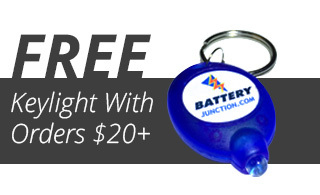 Of course, Battery Junction delivered it fast as usual too! I bought 2 of these, and I'm Really Happy with both of them! Great Light especially for the price. Did not realize at first it was duel switched brightness. Found it too bright at first for some uses. Now I see how to switch the brightness and love the little light. As Low As: $1.25 Ea. As Low As: $0.85 Ea.